The Cleveland comeback has stalled. Once hailed as a shining example of rebirth in our industrial heartland, Cleveland now sits rudderless and drifting backward. Between 2000 and 2007, Cleveland suffered one of the largest proportional population losses in the country: the city shrank by 8%. Per capita income growth in Cleveland also lags behind cities like Cincinnati, Milwaukee, and Pittsburgh. Since the early 1990s, the gap between Cleveland and these other cities has widened. As a regional economy deteriorates, the pressure for social services goes up. It’s not surprising, therefore, that local tax rates in Cleveland are among the highest in the country. Political corruption also takes a toll; Cleveland sits in Cuyahoga County where federal law enforcement officials recently launched a sweeping probe of political corruption. The future doesn’t look much brighter. Cuyahoga County is often described as the epicenter of the foreclosure crisis; since 2000, it has had the highest per capita rate in the country. Overnight, foreclosures have decimated neighborhoods that took years to rebuild. In the Cleveland neighborhood of Kinsman, half of the mortgage properties are in foreclosure. In other neighborhoods foreclosure rates range from 25% to 30% and, not surprisingly, are concentrated in the lowest income neighborhoods, the places hardest to rebuild. About 72 hours after a house becomes vacant, vandals strip appliances, windows, and fixtures (scrap metal recycling is a booming business in Cleveland). Stripping the pipes renders the property a total loss. Meanwhile, the Cleveland Municipal School District is making improvements only at a glacial pace. According to a recent report by America’s Promise, Cleveland ranks 48th of 50 large school districts in high school graduation rates. Fewer than six in ten of Cleveland’s 9th graders will complete high school; dropout factories here include Collinwood and East Tech high schools, where only four in ten 9th graders graduate. Many older industrial cities face the same set of challenges, but few cities started three decades ago with the same promise of regeneration. The collapse of the steel industry in the late 1960s was the beginning of Cleveland's spiral downward. It did not help that 40 years ago, when the Cuyahoga River caught on fire, Cleveland jokes became a staple of late-night television. The city hit bottom when it filed for bankruptcy in 1978. It turned the page with the election of George Voinovich as mayor in 1980. Voinovich, a tough minded Republican, challenged the business, labor and civic leadership of the city to transform Cleveland, and the business community responded. A core of corporate CEO’s organized Cleveland Tomorrow – modeled on the Allegheny Conference in Pittsburgh – which drove a focused agenda of urban transformation. By 1989, Fortune magazine applauded the new trajectory in “How Business Bosses Saved a Sick City”. The partnership between the city and the business community began to shift in 1990 with the election of mayor Michael White. While the business community worked with White to complete projects like a new baseball stadium and basketball arena that had been planned earlier, the relationship between the mayor and the business community gradually deteriorated. A 1995 community push for mayoral control of the city school system represented the last big collaboration. By the time White began his third term in '97, the Voinovich momentum pushing public-private partnerships had evaporated. 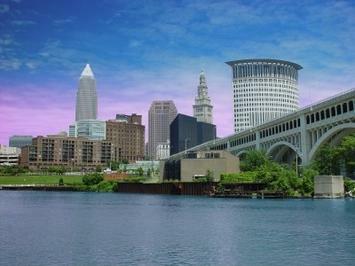 At the same time, dramatic changes were taking place in Cleveland’s corporate landscape. By the late 1990s, the city had lost five Fortune 500 headquarters. Manufacturing, the backbone of the region’s economy, shrank dramatically. As the influence of manufacturing declined, real estate developers emerged as important forces within Cleveland’s business circle. Entering the 2001 recession, Cleveland was clearly in trouble. The Cleveland Plain Dealer proclaimed a “quiet crisis”. The editors started pushing for a master plan for economic development to follow up on the momentum of the Voinovich years. As one editor noted, the region was about to face “economic extinction.” The business leadership responded by consolidating different business organizations — Cleveland Tomorrow (leading CEOs), the Greater Cleveland Growth Association (a chamber of commerce), the Cleveland Roundtable (a group focused on diversity issues), and the Council of Smaller Enterprises (a small business organization) — into the Greater Cleveland Partnership. The Partnership focused its economic development agenda on building a convention center, the last Voinovich era project. It also re-organized a set of affiliate economic development organizations for better control and (hopefully) impact. JumpStart (for start-ups), BioEnterprise (for life science companies), MAGNET (for manufacturing companies), Team NEO (a recruiting organization), and Cleveland+ (a new branding effort) were to drive the transformation of the city-region, renamed Cleveland+. The Partnership has been resourceful in financing. A close relationship with a new coalition of foundations, called Fund for our Economic Future, provides about $8 million a year for the affiliate organizations, and effectively operates as a financing arm for the Cleveland+ strategy. To finance the new convention center, the Partnership pushed County Commissioners to approve a sales tax increase for about $500 million. In July 2008, the Commission — cleverly skating past a public vote (which by all accounts would have rejected the plan) — increased the sales tax unilaterally...and in a hurry. The vote to finance a convention center took place without a development plan, or even a site, in place. So, in effect, Cuyahoga County taxpayers are already paying for a non-existent convention center. The reason for all the rush seems clear. Last July, on the eve of the Commission vote to raise the sales tax, the Federal Bureau of Investigation assembled a team of over 200 agents to launch a public corruption probe, with raids of county offices, the home of one commissioner, and the offices of several contractors. Federal prosecutors are looking into the close relationship between county officials and several contracting and real estate development firms. Amidst the turmoil, Cleveland’s leadership has drifted into a classic case of group think. By shutting themselves off from public scrutiny, they have tried to shield themselves from growing public opposition. But in the process, they have drifted into a dream world that is increasingly detached from underlying market realities. The City’s future, according to the leadership’s current thinking, hinges on a convention center. There’s only one problem: There is no evidence that this strategy will work (and plenty of evidence that it will not). Convention centers represent a formula for low-skill, low-wage employment and public operating deficits as far as the eye can see. Put the convention center aside for a moment. Despite the significant assets within the region, the Greater Cleveland Partnership’s broader strategy for Cleveland is failing to transform the city-region’s economy. There are five weaknesses in the current Cleveland strategy: The wrong approach to scale, to public/private partnerships, to theoretical underpinnings, to change, to decision-making, and to understanding metrics. In Part II, I talk about what went wrong in each of these important realms, and how to strengthen each one. Ed Morrison is an Economic Policy Advisor at the Purdue Center for Regional Development. This article draws from Royce Hanson, et al, “Finding a New Voice for Corporate Leadership in a Changed Urban World”, a case study from The Brookings Institution Metropolitan Policy Program (September 2006). Submitted by AdrianQ on Wed, 04/22/2009 - 04:44. The future doesn’t look much brighter too to General Motors. They are trying to convince the taxpayers to give them more short term loans to help them out and keep them from bankruptcy, a defect was found in 7 vehicles that carry the 3.8 Liter V6 – 3 Chevrolets, 1 Buick, 1 Oldsmobile, and 1 Pontiac. Luckily, none of these vehicles are newer than 2003. Affected models are from 1997 – 2003 model years of midrange sedans. 2004 owners and afterward can rest easy. Recalls are the least favorite things of car companies, even worse than non-obsolescent vehicles. Let's hope that nobody needs any personal loans to participate in the GM recall – GM should be footing the bill.